When traveling along Carretera Austral, we were uncountable times tempted to break our journey or stay somewhere (understand: almost everywhere) longer, only because of the vistas along the road which are spectacular. After a couple of days in southern Chile, we would have been able to reorganize our plans only to see more unbelievably blue rivers, towering mountains or dense forests. This documents how addictive Patagonia can be. It was only our budget which forced us to be selective and follow our original itinerary. Queulat National Park is one of the must-stops on the Carretera Austral first of all because of the easy accessibility and second of all because of the Hanging Glacier (Ventisquero Colgante in Spanish), a true gem of this national park. Once we saw a photo of the glacier hanging on the cliff with a waterfall running down of it, we knew this would be another place we must see with our very own eyes. Queulat National Park, at least the part where you can find the Hanging Glacier, lies near a small town Puyuhuapi where we based ourselves for a couple of days. In case you have more time and flexibility, you can visit also Enchanted Forest or several waterfalls in the southern part of the park. The timing of our arrival in Puyuhuapi couldn't have been better or worse it depends on the point of view. We arrived on December 30 later in the afternoon from Chaiten (Read more: Pumalin National Park: Travel of the Beaten Path) and were lucky enough to find cheap accommodation throughout the New Year's Eve (later we, of course, found out that there was no need to worry as Puyuhuapi certainly is not a place where people come to celebrate the last day of the year, and it is also not a place where hoteliers increase rates only because of this particular date). We wanted to visit Queulat National Park on December 31 and leave Puyuhuapi on January 1, but apparently, the bus between Puyuhuapi and Coyhaique (the biggest city on Carretera Austral) runs every day BUT January 1. We did not feel we want to hitchhike as the distance was quite long, so we decided to extend our stay in Puyuhuapi for another day and glad we did, as the last day of the year was the rainiest day we've experienced during our six months travels in South America so far with 40 mm precipitation in one day - so it allowed us to rest the whole day in our room and enjoy the Hanging Glacier in much nicer weather the next day. Sometimes it is better not to plan anything, Patagonia will plan it for you without asking for permission. It brings us to weather. Queulat National Park is one of the rainiest places in the Chilean Patagonia. Yearly precipitations range between 3500 - 4000 mm. Always check the weather forecast because when it rains a lot, the glacier is hidden behind thick clouds. The good thing about Patagonian weather is that it changes quickly, so the cloudy day can become a sunny one within minutes - when it seems you're not lucky with views, give it a chance and wait a bit, it might clear out! We had clear and blue skies only couple times throughout our 14 days Carretera Austral adventure, once when we hiked to the Cerro Castillo lake and next during our border crossing from Villa O'Higgins to El Chalten in Argentina. You can stay in Puyuhuapi, the closest town, about 22 km from the park entrance. There are several hotels or homestays - you can check the availability via Booking.com. We stayed in cozy but cheap Hostal y Cabañas Ventisquero. If you are looking for something truly special, book the Puyuhuapi Lodge & Spa. Nestled in a fjord and only reachable by boat, this accommodation will make your Carretera road trip unforgettable. 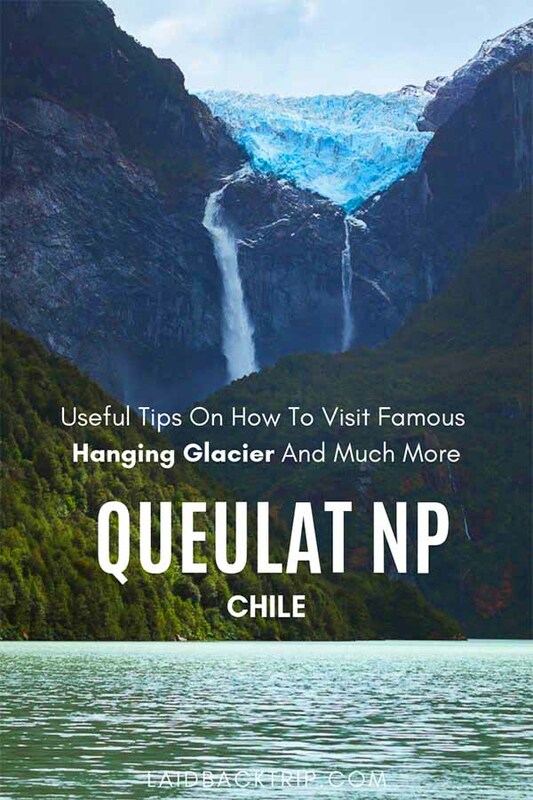 Entrance fee to Queulat National Park is CLP 5000 for foreigners and CLP 3000 for locals. You must pay at the ranger's station - you also need to fill your details such as passport number, but it is not necessary to have the original passport with you. Although the Hanging Glacier is the reason why people visit Queulat National Park or overall Puyuhuapi, there is no public transport going directly to the park, which is a shame, especially when you have to pay pretty steep entrance fee (for three or so hours spent in the park). When traveling without a car, missing public transport connection to the national parks was one of the biggest disadvantages we had to deal with when road tripping Carretera Austral, and we always had to look for ways how to get to remote places, for example when we wanted to explore Patagonia National Park or finish our journey in Villa O'Higgins which is literally the end of the road. If you are traveling by car, follow the road from Puyuhuapi and after 22 km turn left, pass a small restaurant. Carry on, and after another 700 meters, you will find a ticket booth. After that, you can drive another almost 1 km to the parking lot where all the trails begin. Without car, you have three options. The first option is hitchhiking (that's what we did both ways and were successful almost right away: first ride was with a gay Israeli couple and the second one with Chilean couple from Santiago who were visiting Patagonia for the first time). Second way is to wait for a bus going to a nearby town Cisnes. The bus leaves every day between 8 - 8:30 AM and you can ask driver to drop you off by the entrance. The bus waits in front of the small shop Entre Verdes. The last option is to be between 8 - 9 AM in front of the Mi Sur restaurant and wait for the park's ranger who can give a ride to some tourists on his way to work for CLP 3000. Except for several short hiking trails, you can take a 30-minutes boat ride on the Laguna Tempanos. It costs CLP 6000 per person. Although it might be a nice experience, we think you won't get a better view from the lake's surface, than from the most popular viewpoint. We knew that later on, we will take the boat tour to Marble Caves, so we skipped on this one. There are four trails in the park you can follow, but the best is at the same time the longest one: Sendero Ventisquero Colgante. The 3.3 km long path (one way) will take you across the rapid river and through dense forest to the best viewpoint in the park overlooking the glacier hanging above a cliff. From the glacier, the constantly melting water creates two running waterfalls, and the cracking sound of crashing ice completes the awe-inspiring atmosphere. The whole trip should take you around 2.5 hours. The trail can get very muddy, especially after rain so watch out. Although the Hanging Glacier is the shining star here, on the way to the mirador, do not forget to observe the flora along the trail. You can see Patagonia native plants and trees, ferns or beech trees to name a few. In Queulat National Park live foxes and pumas, but the encounter with them is very unlikely, the best bet is to see birds who are not shy of people at all. From the north of the Carretera Austral, Chaiten, take a bus which goes three times a week to Puyuhuapi, or you can arrive in La Junta from where the bus goes every day early in the morning. To get to Coyhaique, there is an everyday bus at 6 AM, do not forget to buy the ticket at least one day in advance in the grocery shop next to the police station as the bus tends to be full, and you would have to wait for another bus the next day.